…And here I thought I was going to write about Pesach (Passover) and the incredibly deep spiritual importance of Unleavened Bread…about purifying oneself. But the RUACH haQODESH has a different path for this article so instead, I’ll share something that recently happened to me and share how deliverance recently changed the course of my faith journey and ministry. Here we go! FIRST, this isn’t easy. But PRAISE YAHUSHUA! RUACH likes to take us out of our comfort zone for Abba’s KAVOD (Glory)! You know what I mean. But allow me to back up a minute…Have you seen the NEW PRAYER TEHILLIM – PSALMS Videos on our YouTube Channel? What a JOY it's been to lift YAH’s WORD and share it in this spiritually intimate way! SUMMER WARNING 2018! – Dr. Bill’s Prophetic Clarion Call to Arms! With One Accord Ministries blasts the prophetic Shofar in a fervent CLARION CALLto COMBAT PRAYER against the enemy’s summer's satanic feasts & schemes to kill & destroy you and your family! Dr. Bill also shares intel on the rising of the BLACK SUN, hidden DANGERS of the Summer Solstice, and a little about his NEW Masonry DVD, UNHOLY COVENANTS: Challenges for the Christian Mason! Tempeh is a healthy, fermented power-packed protein food made from organic soybeans. I discovered it about two years ago, and since learned to love the versatility it gives me in preparing plant based, delicious meals. 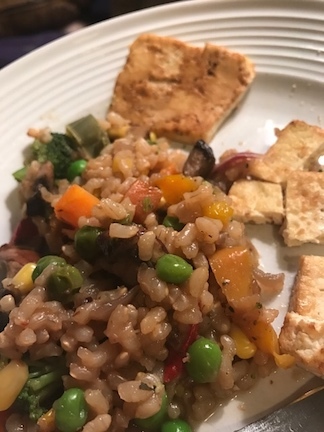 Versatile as tofu, but with a more chewy, meat-like consistency, both Bill and I love it! 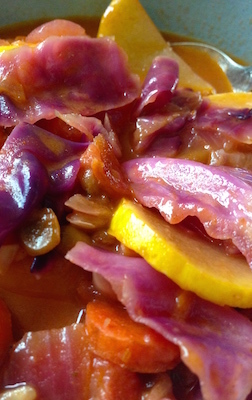 Find out how easy it is to make a delicious plant-based 'meaty' BBQ in this step-by-step video! Learn how to use the Instant Pot to pressure cook Tempeh into that oh-so-perfect meal...FAST. 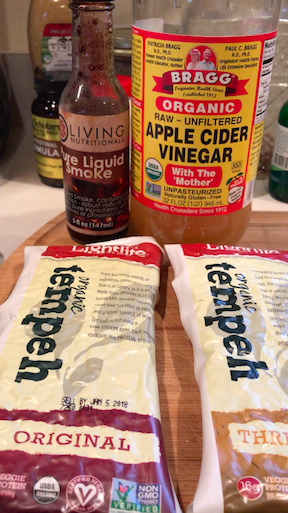 As a SPECIAL BONUS, I prepare my special barbecue sauce/marinade that makes Tempeh into a delicious, sliceable plant-based main meal your family will love! Nom Nom! 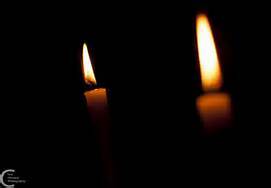 This article was inspired by the Ruach haQodesh during prayers, after I encountered an eye-opening note on Facebook. 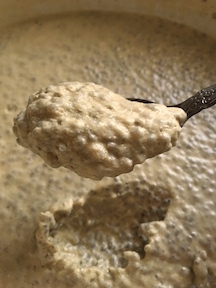 A 'Friend' there made a post about 'getting the leaven out' that REALLY caught my eye (Thank You Bridget!) 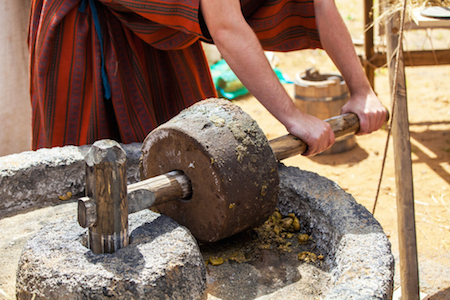 and made my spirit light up - soon, I was digging deeper into Scripture and doing research to answer the question haunting so many Set Apart Believers: What exactly is LEAVEN? Friends from all over have often asked me this question, and to tell you the truth, I didn't have a definitive answer...until now. Like most, I followed what tradition mandates. The truth is, leaven is not what most people think! No oil, added fat, gluten or sugar! Vegan Taste is outta’ this world! One night after a long day last October, I threw some cooked sweet potatoes, onions, barely ripe saved-from-the-frost cherry tomatoes and about half a red pepper into the fry pan to ‘grill’ – and added them to some leftover brown rice (I like to cook my rice with onion powder and Better than Bouillon). But with the added veggies I had about 1/1/2-2 Cups of leftovers…what to do! Craving something with a savory slow-cooked but fast recipe for dinner, I decided to whip up some veggie burgers for that fire-roasted flavor we love during Sukkot! 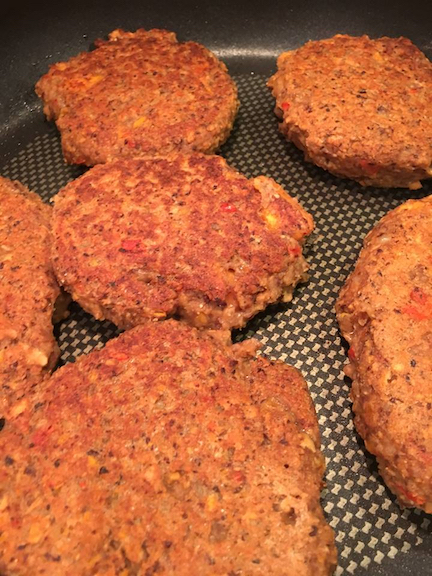 When Bill tasted these his eyes got big…and several long minutes later, he told me they were the BEST veggie burgers he’d ever had! EVER. Praying your family enjoys them, too! DURING THESE TROUBLING TIMES, we all need to pray more! Hopefully, whether you're a first time visitor here or a long-time Friend of this ministry - the absolute, RESOLUTE IMPORTANCE OF PRAYER has been shared with you and your loved ones...and while FREE RESOURCES of PRAYER are posted here so that we might all agree together in unity and in the Spirit of the Living YAHUWAH we serve for the Salvation, Liberation & Protection of His people - sometimes we have doctrinal differences that the enemy will try and use to bring division. This happens in congregations, families and across denominational lines and ministries - some Believers even fall backward into sin or leave the faithful Set Apart calling of Messiah because the infighting becomes so brutal and relentless. This prayer of the heart is for those challenged by these trials, tribulations and attacks! The RUACH ha KODESH (Set Apart Spirit of the Living YAHUWAH) bestowed this prayer on us a few days ago, and I wanted to share it here, with you. May it be a comfort and blessing to you and your family. Winter blahs. Chase away those doldrums with a dessert reminiscent of your favorite summertime treat! But instead of a freezing cold, artery-clogging store bought ice cream - make this delicious, MINTY CHOCOLATE CHIP chia treat instead! I used dairy-free chocolate chips (use any kind you like! ), raw cashews, protein-packed chia seeds and soy milk for a nutritional power-punch that'll get everyone up off the couch and moving! 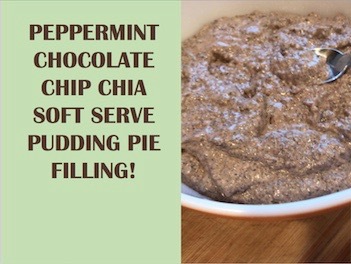 The TASTE of this minty-chocolate dessert is AMAZING! Bill says, 'This is the BEST dessert I've ever had in my life!' High praise, indeed! HAPPY HANUKKAH! During this Season of Lights, Hope & Miraculous Wonders, Dr. Bill and I pray that you and your family are doubly blessed - First, with the Salvation so sacrificially, lovingly given through Yahushua haMossiach (Jesus Christ the Messiah) and Secondly, with the indwelling of the Ruach HaQodesh (Set Apart/Holy Spirit of Yahuwah)! There is NO GREATER GIFT! In our December newsletter, THE LIBERATOR! we share the Good News and pray Bill's feature article, YAHUWAH'S SEVEN PILLARS OF POWER, will bless you and your family. This teaching is a deeply anointed revelation of the Messianic Prophecies found in Isaiah. Prayer changes us profoundly. As we seek to know Abba Father through our Saviour Yahushua - we are changed. Like a child we rest in Him. 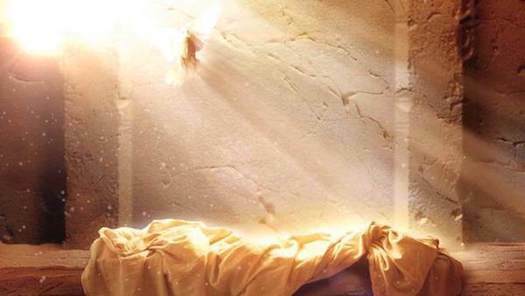 Allow Him access to all those forgotten, wounded and murky places so well guarded...until that time when His Set Apart Spirit (Ruach HaKodesh) turns us again, and brings His fire and Light to wash us with the Living Waters of redemption. It’s so miraculous, the transformation that takes place! 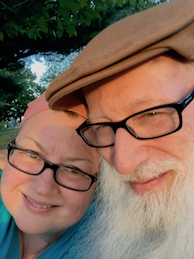 Sukkot is nearly here, and while there is so much to do before those Set Apart Feast Days, taking the time to prepare ahead can make all the difference! 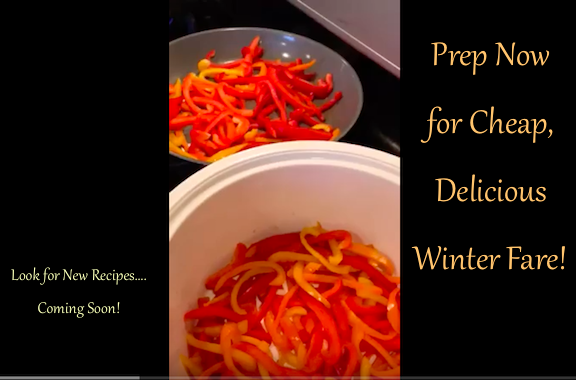 Especially when the costs for generally high-priced, organic produce has dropped drastically - I hope his short video will help you get started prepping for winter and inspire you to head to the market for those discounted gems! These are difficult times to live in. We are called to help Believers in Messiah fight the good fight. WOAM's June 2017 THE LIBERATOR! was forged in the fires of the Ruach haQodesh out of a keen desire to bring unity, spiritual warfare understanding, equipping and power to the Set Apart ones of Messiah Yahushua! We pray our outreach and this Free Resources blesses you and your family! To read my article, follow the link for more below. I am working to generate active links for all of the highlighted text - please pray for us dear Friends! Thank You Dear Friends & Partners for Your prayers & financial support! May Abba bless you! Another Pure & Simple Recipe for you dear Friends & Partners! We're still working to bring Abba's Original Intent, Plant-Based eating plan of scripture to you through Dr. Bill's Teachings, my recipes, tips and now - cooking videos! This recipe is on YouTube on Dr. Bill's Channel under the category: Scriptural Health & Wellness. I had a blast doing this and I plan more recipe adventures in the future. Praying you are blessed and inspired to collect a few more healthy, plant-based recipes and try them some night - you're family is gonna' love this chili! HALLELUYAH! NOTES FROM MARY from the March 2013 edition of THE LIBERATOR! The Ruach (Holy Spirit) wants me to RE-share a very personal miracle with you. During the 2012-2013 I’d been fighting exhaustion with heart palpitations and tachycardia. 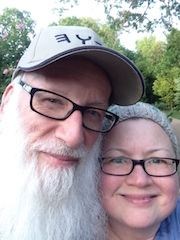 Now, I don’t need to tell most of you what that means for a spouse, a ministry, a family…this in addition to no insurance and medical bills from multiple hospital visits. Still, Messiah is FAITHFUL! Bill and I love fried rice – but SLAM on the brakes! Fat is off our food list and for good reason. Eating just one hamburger or other meat or dairy product elevates the fat level in the blood within 30 minutes after a meal – and blocks the insulin receptors from doing their job. This means higher blood sugar levels that can lead to diabetes. Check out Dr. Greger’s video on lipid toxicity and how it causes insulin resistance, and why you should start thinking about lowering the fat in you diet! So, my NO FAT ‘fried’ rice recipe has no oil or fat added BUT THE FLAVOR IS AMAZING and it DELICIOUS! Basically, we’re just going to use the Instant Pot to cook the rice and add some vegetables! Bill bought me an Instant Pot (IP) several months ago, and I've been creating my own recipes using this amazing, labor & time-saving, awesome cooking method with great satisfaction... but not to worry! If you don’t have an Instant Pot, the rice can be cooked on the stovetop. This method will yield the same wonderful, savory, no fat results! Bill and I are SO very THANKFUL for everyone who has prayed & fasted with us for Abba’s ministry here at With One Accord. So many lives have been transformed - because YOU took the time to intercede, pray and share your precious finances for the work of Yahuwah! THANK YOU & ABBA BLESS YOU ALWAYS! 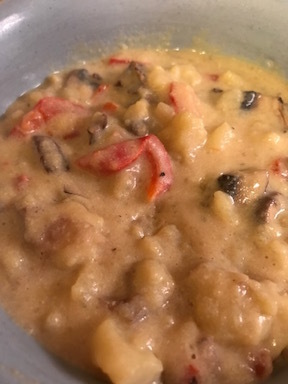 With gale force winds, freezing rain, snow and long cold evenings to look forward to, nothing says, ‘Ah, I’m hooomme!’ more than a cheezy, savory hot stew. I’m talking ‘taters’ and cheeze precious – cheezy rice and as many hearty root vegetables as you can fit into your oversized cooking pot! HalleluYAH! Experimenting with different ways to bring the comfort of a non-dairy cheese into some of our winter meals has been a lot of fun! Both Bill and I want to avoid the fat, puss, drugs, excess hormones and cholesterol in regular cheese (not to mention the excruciating lactation-inducing painful drugs given to cows these days), so I’ve been working on a quick, EASY recipe that’s chock full of protein and bone-strengthening minerals that tastes amazing! Smoky Cheezy Sauce mixed over sautéed spinach and corn - they'll eat EVERY bite - GUARANTEED! This delicious latke recipe is totally plant based! Updated from the original posting in 2016, this simple latke recipe will keep them coming back for more! Using only a smidgen of the oil usually used for 'frying' traditional latkes, these tasty Hanukkah treats are golden and crunchy on the outside with the soft, savory flavors you've come to expect in a perfect latke. ENJOY! Many friends listening to Bill teach have heard him quote one of my favorite sayings: ‘There’s Power in Obedience!’ Over the years, I’ve had more than a few hard lessons – and found that, when we lay down our own ‘personal’ truths, needs and hurts at Calvary’s Cross and take up Yahuwah’s Truths, Desires, and Commandments - no matter the cost - we gain purity and power beyond our limited, mortal comprehension. Some already understand who they are in Yahushua, and Who He is IN them. Those with the gift of heavenly, visual discernment (spiritual sight) like my husband, Bill, actually see the results of hard spiritual work, anointings from Ruach emanating from a person. Just this morning he saw three Malakim during his prayer time. Lately, this happens more often than not. We believe it is because of the presence of YAHUWAH through prayer, fasting, Scripture study and the End Time anointing - He has brought all this through With One Accord Ministries for His Beloved. Yet ALL OF US are called and anointed in one way or another, and we ALL NEED each other. We are all just dust-walking, heaven-bound instruments – nothing more, yet nothing less! On Friday morning, Ruach gave me a BIG nudge to bake something NEW! This summer has been hectic and we’ve been running at top speed – but when Ruach calls we answer! I heard the VOICE and headed into the kitchen…and I’m SO glad I did! The result: SOMETHING WONDERFUL to have in the morning to celebrate Bill’s Birth Day and 30 Years in Ministry! Could there be a better reason to celebrate with a special little baked blessing? I pray you and your family enjoy all the goodness in every bite of these sustaining, delicious, nutritious cookies! PLEASE, pray about becoming a monthly Partner with us – your Gifts are spent prayerfully and wisely! THANK YOU DEAR FRIENDS & PARTNERS! HALLELUYAH! Women are a blessing to the Body of Messiah. As Believers, we must begin to see through Spiritual, Biblical eyes at the vast resources so long overlooked by the Church because of Roman indoctrination and teachings. Sadly, even today, most of what we 'know to be true' about women and their role in our congregations, the home, and society at large have been handed down to us Roman and Greek heresies or grossly misinterpreted from the Pauline writings. 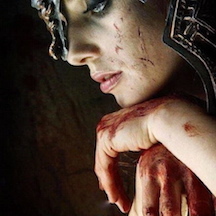 We only have to look at how Yahushua Messiah taught, included and treated women to see that Biblically speaking (using HIS example in continuum and treatment as a guide), what we experience today is vastly different than YAHUWAH's original plan. This article, Women and Wisdom, is for all those seeking Wisdom, once so readily received and lived, by our Messiah according to Torah. I like to save time by using canned organic beans, and stock up when they’re on sale. 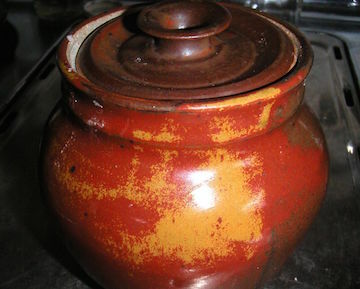 (You can also use dried beans. They’re the least expensive. Just soak overnight in the frig, cook, cool and use as you would any canned bean!) And don’t forget the black olives – they are the key to this delicious recipe! If you prefer green olives, use those. 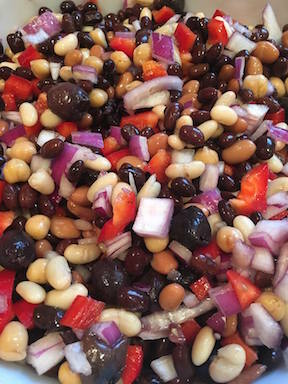 For this salad, use at least 3-4 different types of beans – I’ve listed our favorites but you can change up this recipe to whatever your family likes the best, too. Ingredients for the Brine are measured here for canned beans (in at least 12 oz cans). This Brine also makes a DECLICIOUS vinaigrette salad dressing. As a matter of fact, Bill and I usually put our bean salad over our leafy greens – it’s so good! I always try and use two cans of black beans because they’re SO VERY HEALTHY for you and they taste wonderful…this recipe makes a huge amount of salad BTW - but if you have a large family or eat it every day like we do – this recipe is jussst right! THANK YOU for your prayers & donations to With One Accord Ministries! Are you hungry for change? Me too! After a long dreary winter, most of us are. Politics aside, I’ve been longing for more fresh air – more sunshine! Praise YAH spring HAS sprung! HalleluYAH! That means a venturing outside to enjoy the gifts YAHUWAH has blessed us with – maybe plant a garden? Dig up the weeds we didn’t quite get to last autumn? Any excuse to be outdoors seems good enough! But we’re all busy, too. It all takes time. So with that in mind, here’s a quick and easy recipe for some of the best Plant-Based Creamy Cole Slaw Dressing EVER…! 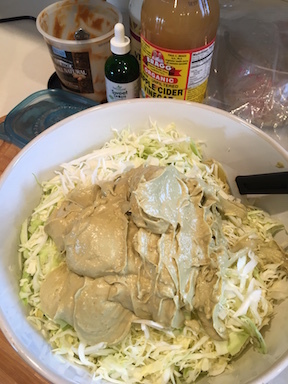 My friend, Maria Merola Wold, shared her recipe on Facebook for an Oriental Coleslaw Dressing, and I simply had to try it! In order to avoid a trip to the grocery store I changed up some of the ingredients and instead, just used what I had on hand –HalleluYAH! Since avocados are less expensive this time of year (and delicious! ), I decided to use them as a base for texture. Plus, avocados are delicious and VERY RICH in omega oils! They will slightly diminish the bright green color of the cabbage, but it's ALL ABOUT TASTE & NUTRITION in this house! My take on this Coleslaw dressing is creamy with a light tang, slightly sweet, and yes - the hint of peanut butter surprise keeps ‘em coming back for more! Bill just LOVES this dressing – Thank You Maria! This Coleslaw recipe originally came from my mother’s kitchen. I add the shredded kale to take the ‘green’ factor up a notch (even though I used red cabbage). The dressing, made with horseradish, adds zing to this slaw when paired with a loose-leaf salad (use the slaw like ‘salad dressing’) - or use on top of a toasted cheesy herb bread sandwich! Just delicious! With a little shredding time (about 10-15 minutes), a powerhouse of cleansing anti-oxidants becomes a delicious addition to your meals. But don’t let the small amount of parsley (proportionately) in this delicious salad fool you. Extremely rich in Vitamin K, even a small amount of the herb boosts kidney function substantially. Combined with the anti-inflammatory, anti-cancer agents in cabbage and the cholesterol-lowering benefits of kale, this salad’s creamy texture and TASTE will keep ‘em coming back for more! Lunch just became Irresistible! We've been having thunder snow, sleet and blizzard conditions here in Iowa. Not fun! But toward the end of my prayer time yesterday, Ruach haQodesh (Holy Spirit) nudged me into the kitchen...well, the result is this amazing new Shepherd's Crusty Cheese-Herb Bread! What a wonderful surprise when Ruach intervenes and 'downloads' a fabulous new recipe! Many days, the recipe is for prayer...prayer for empowering weary warriors, those under attack from dark spiritual forces, and for many other oppressions but oftentimes, prayer for blessings, encouragement and empowering. But yesterday, the Word given to me was about the sanctification of the body through what we put into our temple, where the Creator of the universe resides. 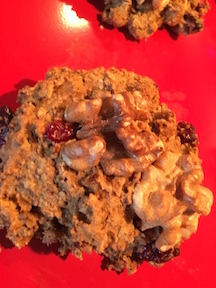 Dairy and Egg Free, Low Gluten Einkorn Flour for Sensitive Tummies - Delicious! Banana bread amped up and delicious! 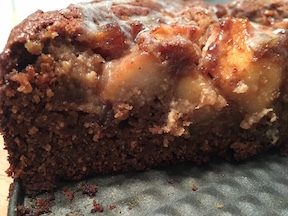 Your family will love this moist apple-cinnamon banana trio! Lightly sweet like Mama's old-fashioned apple doughnuts but with half the calories, this recipe provides a nutritious powerhouse for breakfast, snacks and tea-time. An original recipe given me by the Ruach haQodesh (Holy Spirit), this bread is made using Einkorn Flour. Einkorn is an ancient, tall wheat variety virtually lost until recently - having all the benefits of non-hybridized, ancient grain wheat and half the gluten of today's GMO toxic varieties. Being gluten sensitive and on a very strict diet for over three years, I'm ecstatic about this new discovery! This bread is more like a moist tea cake, and Bill and I love the cinnamony combination of apples and bananas! 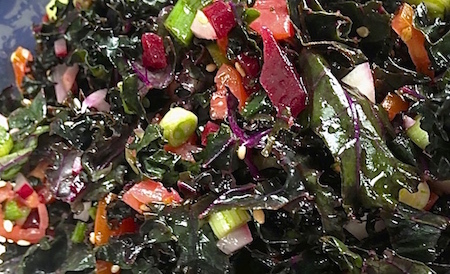 This flavorful, raw salad is full of enzymes, micro-nutrients and vitamin C for fending off the winter doldrums and those nasty flus going around. 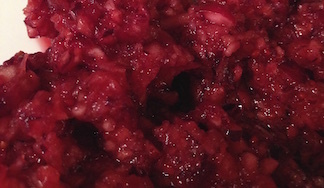 You can sweeten it up or keep it nice and tart - either way, it will bring your body back to a nice, alkalized state of 'ahhhh' and help flush out those extra little sugars accumulated over the holidays...excellent with veggie loaf and a healthy starch like sweet potatoes, this recipe isn't just for holidays! 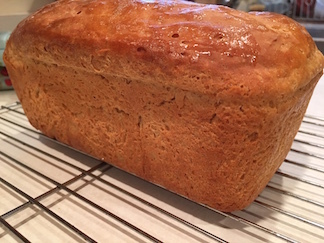 Einkorn Sandwich Loaf - First Attempt! So, a few days ago I made the Einkorn Sandwich Bread Recipe (exactly) from the Jovialfoods.com website. This is the LINK to their recipe. This dish wakens the palate with a Warm, Vibrant Tang! Caribbean Roasted Lime Veggies is fast and delicious hearty comfort food with a bright 'snap' that doesn't overpower the palate. Bill said this was HANDS DOWN THE BEST SAUCE he's ever eaten in his life – and it can be added to ANY combination of vegetables! Occasionally when time is short, I even use 90% frozen (organic) veggies (see pic) and the dish was still amazing. But I don't take credit for this kitchen creation - Ruach inspired me BIG TIME on this one! Before making this dish, I'd never eaten a Caribbean flavor in my life! Oh my, it's So Good! Enjoy! 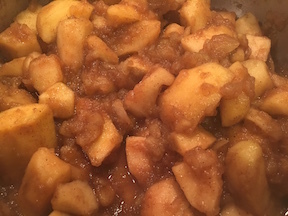 Making your own chunky applesauce is really the only way to go if you love this traditional snack! Oh sure, it takes a little time and of course, the investment of labour and organic apples. But in no time at all, you'll have the sweetest, antioxidant rich treat for those cold mornings when the oatmeal tastes a little bland or your favorite muffin could use a boost of flavor! I love this recipe because it's 'kicked up a notch' with ginger and cinnamon - two of the best spices for lowering/regulating blood sugar and calming the stomach. And the smell...wow! I use this topping on my Apple Ginger Cinnamon Cake and on my Apple Spice Muffins. But I have plans to make more for snacking and to garnish our vegan dinner plates! YUM! Baby, it's cold outside! When the family gathers into the kitchen (and they always do!) after a healthy walk or outdoor activity, this is the cake that'll keep them coming back to the kitchen. Moist, lightly sweet and full of ginger and cinnamon, this is THE cake for the holidays. Top-loaded with homemade chunky applesauce and finished with just a wee bit of glaze, this plate o' love will burn brightly in their memories for a long, long time. 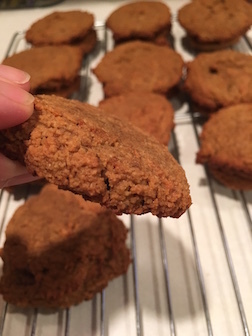 Ginger has always been a family favorite, so it takes a VERY special ginger dessert to tempt those who know and love Mom's Triple Ginger Cookies (to be posted soon in Heritage Recipes). But the inside of this cake is moist, and just melts on the tongue - while the outer rim of crust is ever-so-slightly chewy (like a soft cookie) and guess what? Even the toughest taste testers loved it! HalleluYAH! If this inspired recipe brings you and your family noshing joy, please remember With One Accord Ministries with a small gift - Thank You for Your Prayers and Donations! Plant based, gluten free, refined sugar free, egg free and totally addictive! This amazing recipe fills all the nooks and crannies of a home-style eggnog plus adds the rich texture of pudding or pie filling. Enjoy as a healthy snack, or use as a topping for oatmeal, warmed slightly over chunky applesauce or pie, or in plant based muffins for a moist, rich texture. If you love eggnog, this is for you! For those pursuing a grain-free, gluten-free, dairy-free lifestyle, this comfort food also fills the tummy with the goodness of chia’s protein and coconut milk, and it keeps very well. Downsize the recipe to make a smaller amount to try it the first time – but you’ll wish you hadn’t! YEAH, it’s that good. This is an original copyrighted recipe given by Ruach haQodesh for the people of Yahuwah! Thank you for your gifts & donations to With One Accord Ministries. Check my Blog for the latest recipes and tips on set apart, healthy living! Holidays are a special time for baking with warming spices like anise and ginger, nutmeg and cinnamon. Foods made with these aromatic plant extracts bring ordinary foods to life - and are used by cooks all over the world to enhance the flavor of their main dishes as well as holiday pastries, pies, cakes and cookies! Growing up, my mother's kitchen always smelled of Rugelah, sugar and chocolate cookies...molasses, ginger and biscotti from Thanksgiving through the year's end! Oh my...sometimes she'd have 20 different kinds of cookies piled up as I walked through the door after school! The smell was nothing less than heavenly. But mom's favorite cookie was anise biscotti - the smell so pungent that when I get a whiff of it now the memories come back in mouth-watering clarity...I loved her perfect, lightly golden cookies! And Mom's cookies were never hard like commercial biscotti - they were softer, more delicate and just melted on your tongue. So with that in mind I created this once-baked (rather than twice-baked like traditional biscotti) anise cookie. This recipe can be made Paleo (using eggs) or egg free. Either way it's Gluten & Grain Free, and will fill your kitchen with delicious memories that will last a lifetime! HEADCOVERINGS Obedience - it's Miraculous! 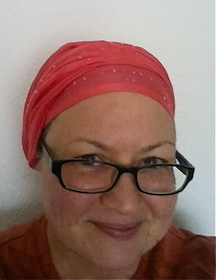 This is my personal testimony concerning headcoverings for women…the Ruach HaQodesh (Holy Spirit) has inspired me to minister to women the spiritual revelations, authority and divine strength available to them through obedience to the Word of Yahuwah. This is what I have been shown through the scriptures, sound Biblical teachings and the Ruach about this somewhat controversial subject. It can make all the difference in the power of a woman’s (or man’s) spiritual life! And remember, the power of the Almighty - especially manifested in a woman’s life - ALWAYS stirs controversy from the unfortunate and widespread misinterpretation of Scripture. This salad brings a sweet & savory crunch to the plate with a refreshing, nutritious mix of greens and vegetables. This is a great Mediterranean dish I have adapted to suit our dietary needs. NO GLUTEN. I prefer to blanch the kale and cook the quinoa one day, refrigerate those to chill, and prepare the salad the following day. It works for me because I don't have long periods of time to fuss when we want a delicious alternative to plain salad, and blanching makes it a more tender meal! Cinnamon Spice Cranberry Muffins * Free of Oil, grains & gluten! CINNAMON SPICE CRANBERRY MUFFINS Free of oil, grains and gluten! These muffins just burst with moist, subtle spicey flavor! For a healthy breakfast or snack they go the distance with an irresistible undertone of sweetness that doesn't overwhelm a sensitive palate! Just right for those cold mornings with a favorite cup of Earl Grey of mocha!